Dust off your browncoats, a new collection of original Firefly stories is being put together by Titan Books. Jane Espenson, the writer of Firefly episode "Shindig," revealed an upcoming collection of new stories set in the Firefly universe while she was out promoting the Battlestar Galactica prequel series Caprica. She told ScifiWire: "Titan Books is putting together a collection written by various of the Firefly writers." 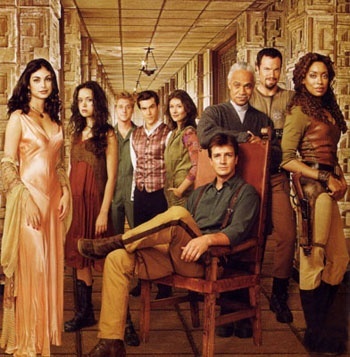 Firefly is a sci-fi television series that gained much of its popularity after a premature cancellation in 2002. A feature length movie called Serenity was released to give fans some closure, but not much else has been seen of Firefly other than two comic book mini-series (and a bunch of eternally continuing fanboy love). All we currently know is that Espenson is penning a very short story for the collection. She says: "Oh, I just came up with a very clever little short story that involves Kaylee and Wash, two characters that we haven't seen together that much ... But [it's a] very short story, ... 2,000 words." No other writers have been specifically named, nor exactly what they will be putting forward. The Firefly television show may still be dead for now, but this new anthology could breathe a little more life into the franchise. I enjoyed the last comic book mini-series, a tale that took place before movie Serenity, which seems similar to what the collection of short stories will be. If a story can possibly be told that takes place after the movie, I wouldn't mind seeing that either. Maybe Joss Whedon can also get involved now that Dollhouse is done for?